I enjoy painting because it is perhaps one of the few art forms that do not stick by rules. I find music and dance to be very technical as you go deeper into the subject, but art on the other hand has no rules or knows no boundaries; it forms and reforms continuously. And I have never stuck to one type of painting. I wonder what my Guru would have said if I told him that I don’t stick to a color scheme, a type of art or even a common color medium in a painting. I really miss discussing these with him which sure would have started an interesting debate between us like all those previous ones. I miss him! Anyways, so when my Friend from French class, Aditya proposed a mural in his room, I was all excited about the idea predominately because it was something I had forgotten about and which I could further explore. Several years back, when our house was renovated, everyone got a room for themselves and I got the attic. That made me happy because, for the first time I got a room for myself, that too with a beautiful view from its small windows made completely of wood. 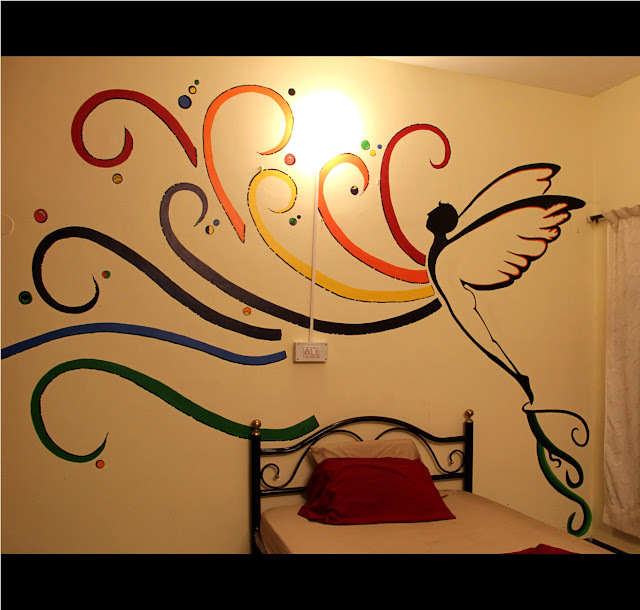 One of the first things I did was to paint the wall, with a flying swan. That was my first mural and since then there had been none; none until now! So the idea of having a complete wall as my canvas made me happy but also a little worried. I really did not want to mess up my friend’s bedroom wall. If I did so, he would curse me for several years during which he would stay in that house. Aditya very clearly knew what he wanted. "It’s a man on top of a cliff, with his arms turning into wings as he prepares himself for a glide into the colorful sky." He had said. The idea appealed to me and I immediately made a sketch. We exchanged emails discussing whether or not we wanted to paint the entire wall. It took me 3 months to decide. Thanks to Aditya for being so determined on executing it while I still wondered if I had the confidence. So one fine day, I landed at his house and stood in front of a wall approximately 15 X 10 foot in size. That meant, my painting had to be approximately 15 times bigger than the sketch. But once I began it took only 10 minutes for the man to emerge out of the blank wall. I was amazed by that and it gave me a lot of encouragement. Next we brainstormed on the type of color we wanted to apply. Acrylic? Enamel? Oil? We called two of our French professors and one of my friends who are artists and they all seemed to suggest Acrylic. Bhaskar Art center at Avenue road was the suggested place where one could find everything related to art. So we set-off on what was meant to be a quick drive to the place for the material required. But that turned out to be a nightmare of 4 hours with one ways, no parking, crowded streets and tiny cross roads flooding with parked vehicles and millions of people. But there are always lessons learned – Don’t drive your car to Avenue road! Painting was great fun and a great learning experience. When you are so close to the wall painting a small part of a large image, you won’t easily realize the flow because of two reasons – 1. You cannot see the bigger picture 2. It is not one stroke but series of continuous strokes that has to merge with one another and flow. But as I began one stroke, the brush just followed the trace and it was intuitive to form the silhouette even without a hawk eye view. With our french class timings no more matching, we had to choose a night to do the third stretch of the painting. Now, the man got well defined wings; he was provided a cliff to rest his foot on; some of the ribbons were finished and they got a black underline. Parag experimented with broken lines that seemed much more appealing than a continuous black line. That night it took us almost till 2AM to say “on s'arrête !" A holiday for Dasera was a perfect time to finish the work. I tried to bring some of the colors from the ribbon into the wings by giving a layered pattern of red and orange. Parag experimented with what we now call the bubbles that I think gives a very lively feel to the painting. And thus "The evolving man" evolved! I hate it when something nice is over because the amount of joy I gain during the process of painting disappears with it being complete; it is in the process that I find peace. But like the name of the painting goes, I believe that every great experience evolves me and this work of art has evolved me greatly by making me return to a state of mind that explores the unknown and the unfamiliar by expanding my boundaries even further. And in all such events where I am part of something really nice, I remember Richard’s words from one of my favorite movies “The Beach” - “ And me? I still believe in paradise. But now at least I know it's not some place you can look for. Because it's not where you go. It's how you feel for a moment in your life when you're a part of something. And if you find that moment... It lasts forever".